The shepherd had gone missing for three days. 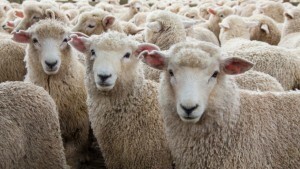 The sheep responded as sheep do when they realize that they’re on their own with no one to lead them, no one to protect them, no one to provide for them. They froze in fear and had a nervous breakdown. It’s taken me some time to realize this and I’m still working to trust it more fully than I do, but there is great comfort simply in knowing that the resurrected Jesus Christ is alive and present with me. The world doesn’t have to change, my situation doesn’t have to change, the danger may still be just as present as it was, but its’ okay and I can get through this and move forward and actually live, as long as know that the risen Jesus Christ is present with me. The unbelieving world doesn’t get this. And I’m a part of that unbelieving world and so are you because our faith is always weak and we all have our doubts. Apart from faith in the risen and living and always present Jesus Christ, “peace” for my life is dependent on all of the outward circumstances of my life and this world lining up just right. And what little control over these things we have. Apart from faith in the risen and living and always present Jesus Christ, our only hope for real and genuine ‘peace’ is if the politicians and the economy and the media and the doctors and our neighbors and friends and our family do what we want them to do – which of course has less chance of ever happening than if someone nailed to a cross has of being alive and present with us three days later. And He said to them, ‘Why are you troubled and why do doubts arise in your hearts?’ I think that we who have heard the Easter story so many times lose sight of just how mind-blowing the whole thing really was for them. When the skeptic or those who are new to the faith hear this and respond, “You expect me to believe this?” they’re probably listening a whole lot closer than we think they are – and maybe more carefully than we are. So, Jesus finds Himself in a room full of skeptics – His own disciples. And I guess His first disciples can be troubled and have their doubts – so can we. But just look how patient He is with them – and just ponder how patient He is with us. He doesn’t tell them to go away and come back with they’ve got more faith and less doubt. That’s the opposite of how things work in the Kingdom of God. He has compassion on them and gives them reason to believe AND reason to stop doubting. He gives them seven proofs that “it is I myself” and not just a ghost or a dream or a hallucination or ‘too good to be true.’ As we look at these proofs of His ‘real presence’ with them, let’s be sure to try to let them have the same effect on us as they had on them – that we too may have His peace. First of all, He gives them VISUAL PROOF. “SEE my hands and my feet, THAT IT IS I MYSELF.” For all who insist that “seeing is believing,” Jesus says, “okay, see for yourself.” He wants them to SEE his hands and feet because they bear the marks of the nails and identify Him as the same one who was crucified. SEEING is important for this group in particular – because He will send them out into this unbelieving world as “eyewitnesses.” And so He gives them an eyeful. Third, He gives them PHYSICAL proof that He is still FULLY HUMAN. “He said to them, ‘Have you anything to here to eat?’ They gave him a piece of broiled fish and he took it and ate before them.” This is no spiritual eating of spiritual food but real eating of real food which spirits that have no physical body don’t do. The Good Shepherd stands before His frightened and doubting sheep and gives them VISUAL, TANGIBLE, PHYSICAL proof that it is “It is I Myself” who is in this room with them. Fourth, He speaks to them and they hear Him. He gives them AUDITORY proof of His real presence among them. This one becomes the most important proof for us today. We HEAR Him speak to us through His Word. And as we HEAR His Word, His Word creates faith and dispels doubts and we have His peace. The principle here is that if someone makes a prediction and it comes true, our confidence in his word increases. And the more SPECIFIC the prediction and the more UNLIKELY or IMPOSSIBLE the prediction is, the more our confidence and trust in his word increases if it actually happens. Jesus had made the most unlikely and impossible prediction of His death and resurrection at least three separate times with His disciples. “See, we are going up to Jerusalem, and the Son of Man will be delivered over to the chief priests and the scribes, and they will condemn him to death and deliver him over to the Gentiles. And they will mock him and spit on him, and flog him and kill him. And after three days he will rise.” (Mark 10:33-34). #6 – The Old Testament. If you think that the fulfillment of Jesus’ prediction of His own death and resurrection is incredible, how much more convincing if the predictions made throughout the whole Old Testament, centuries and centuries beforehand, were fulfilled in every detail. This is how we are to read the Bible – Old and New Testaments. It ALL points to Jesus and His suffering and death and resurrection for our life and salvation and PEACE. But just like these disciples, they didn’t see it. So He “opened their minds to understand the scriptures.” Listen, you can apply all of the wisdom and science and philosophy to understand the scriptures, and they will remain a total mystery to what they’re really all about. But when Jesus breathes the Holy Spirit onto a person, the Spirit opens his mind so that even a little child can understand the scriptures. There may still be lots in the scriptures an ‘opened minded person’ still can’t fully comprehend, but this much we know for sure, Jesus Christ, the crucified One, has risen from the dead, and is alive and is with us, and through faith in Him, we can have His peace. He tells them how HIS PEACE will be announced and given to “all nations.” The book of Acts and the rest of the New Testament is the documentary evidence that tells us that this is exactly what actually happened – AND IS STILL HAPPENING. Even today, the message of REPENTANCE for the FORGIVENESS OF SINS is being proclaimed in name of the risen Lord, Jesus Christ, to all nations. What began in Jerusalem has been proclaimed for over 2000 years and has reached even you and me, gathered here in this room today just as it did them. And He gives us the Holy Spirit who ‘opens our minds that we might understand’ – and believe – and take courage – and have His peace in every circumstance and situation. John was one of those in that room where Jesus appeared on that first Easter night. The opening words of his 1st epistle are a fitting summary of all that we have said.